A place to study. To experiment. To perfect. To play. A laboratory of sensation, a place of natural light, paintings, flowers and books, rulers, paper, fabric and music. The highest form of Table worship. Inspiration all day. I have a reverence for classical pastry technique as well as endless curiosity for international traditions and modern juxtapositions. I’ve had the great privilege of working in the pastry kitchens of some of the region’s best restaurants and patisseries where I found a wealth of mentors, chief among them Mother Nature. Pastry chefs are part child, part sculptor, soul soother, detail beast, pleasure-seeking nomad in search of the perfect little black dress. I favor outlaw pastry – simple, fresh, custom, minimally sweet handmade objects of desire formed in an open space where nothing comes between the art and the practice. I am a beauty commando. This is my pastry altar. Original writing and photography are the property of pastry studio, 2007-2013. All rights reserved. Welcome, pastry studio -- and I do mean WELCOME, you beauty commando/detail beast, you! What a lovely addition to my daily browse -- thank you for this info and inspiration. Brava! Beauty seems in such short supply of late...Thanks. Wow, it is a pleasure to meet you. I attempted to sign in to comment using my google account. I am not sure if it worked. If it did and you get a link to my blog, please, don't hold it against me. I am a complete amateur with not enough time to learn what i need just yet. You will inspire me to learn. You will also inspire to improve in the pastry department and all other fields I find on your blog. Thanks so much for your compliments. You all have such tremendous blogs. I'm happy to join your ranks. We all learn from each other! Your recipes are both visionary and classic at the same time, all the while supported by beautiful photographs. I truly enjoy your blog. Thank you so much for sharing! Joanne, thank you so much for your very generous comments. I appreciate your support! Oh my goodness, I think your blog is my new favorite! I'm still sort of new to the whole "blogging universe" and I post a new recipe each week. Right now I'm a little behind... Shhh no one knows :) I love reading your recipes, they are all super amazing, and look sooo delicious. I will definitely be making some of these! Question for ya... Would you mind if I used a few on my blog as well? I will give you the credit, and post the link to your site here. Keep up the amazing work, you've got a true talent!! Carmyn, thanks so much for your very sweet comments. Yes, please do go ahead and use my recipes. I hope you enjoy them! Your blog looks like a lot of fun. Best wishes to you! Hi Pastry Studio! I'm curious where you work in SF? As I get more into pastry and making items, be fun to stop in and see some of your creations. Thanks for your inquiry. I'm not working in the pastry field these days. That was actually one of the reasons I started my blog - because I missed having my hands in flour, butter and sugar!! We've just started our own blog based on food, fashion and lifestyle and if you are interested in following our blog on blogger we would love to follow and support yours! We wish you all the best with your cooking adventures! 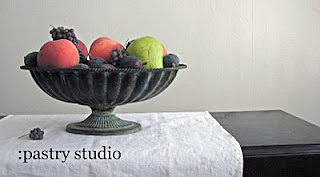 Hi Pastry Studio, I'm addicted to your blog and I only discovered it last night thru Pinterest. Thank you for answering my question about cocoa right away. You're such a great talent. Your creations are magnificent! I don't have a blog, just a fan. I'm a home baker interested and wanting to know more about baking especially cakes and pastries. I hope one of these days you'll feature more on chocolate cakes or other types of cakes the fillings and frostings that is appropriate for such cakes. Right now I'm searching for the best chocolate cake and the softest and delicious butter cake. Thank you, I love your blog. Thanks so very much for your kind support of my work, Elajr. I hope you enjoy the recipes here and have a chance to explore your own talents. Pastry is a blast!! Be sure to look through my Recipe Index. Lots of chocolate there! What a great start to my morning finding you on pinterest! I'm a huge Alice Medrich fan and you posted her Espresso Walnut Cookies which I love. I double clicked your pin and it was like opening a gift! What a great blog! Your recipes are sophisticated yet simple! I can't decide which dessert to begin with! I do plan on making one every week!!! Helllooooo, Antoinette! Thank you for your very generous words. I really appreciate them! Alice Medrich is a great mentor for all of us. Her cookbooks are flawless and everything I've ever made from them has been stellar. Here's to full enjoyment of your pastry journey!